This book takes place after The Wise Man's Fear from minor character Auri's perspective. 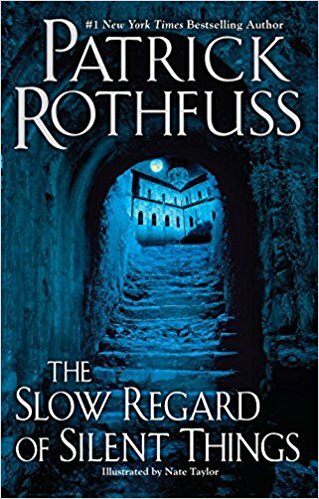 It has no bearing, that I can tell, upon Kvothe's tale, but presents a different snapshot of Rothfuss's world in a unique voice and point of view. Therefore, don't pick this tale up without having read the first two books! If you're interested in reading about Auri and only Auri, then you will find this a quick, engrossing read. Auri lives in the Underthing, a network of forgotten rooms and places under the University. The Underthing is her entire home. She has her own names for things, very few of which was revealed in the other stories, as she is secretive and shy of people. Also, she is very sensitive to emotion and confrontation, running away at direct questions. Readers will know she has befriended mainly Kvothe, for his lute playing and special nature, and Master Elodin, another odd duck. No one else (to our knowledge) knows she lives there as she would be hauled off to Haven, the asylum for people who experienced magical mishaps, because Auri isn't quite...normal. Instead, the characters of her world are objects and places, which Auri gives somewhat human characteristics. For example, her magical light is "Foxen" and acts as a sort of pet; while the large gear she finds, she carries from place to place, showing it the rooms and seeing if that is its place of belonging. In my estimation, I think she could have a form of magical Asperger's since she is very gifted and smart, prefers things to people, and yet everything has to be "just so". I really enjoyed this novella despite not having a plot or purpose other than to get a glimpse of everyday life for Auri. It's sweet how carefully she prepares for Kvothe's visits and takes care of her Underthing, trying to preserve it rather than be selfish and take from the things she finds. The descriptions and work of making numerous inanimate objects and places act as characters shows Rothfuss's talent in a new light, as its truly a delicate, faintly rhythmic piece of short fiction. اليكم شركتنا التى تعتبر افضل شركات التسويق الالكترونى فى السعودية لما لديها من خبرات كبيرة ومتميزه فهى افضل شركات تسويق الكترونى فى الرياض و افضل شركات السوشيال ميديا فى السعودية نسعى دائما لنكون عند حسن ظنكم بنا فنحن افضل شركة تصميم مواقع فى السعودية ونحن ايضا افضل شركة تصميم مواقع فى الرياض فاذا كنت تستهدف الحصول على خدمات افضل شركات تصميم مواقع في السعوديه و شركة موشن جرافيك نقدم اليكم خدماتنا فى الامارات فنحن افضل شركة تصميم مواقع في الامارات تواصلو معنا لكوننا شركات تسويق الكتروني في الامارات نقدم اليكم خدماتنا نحن افضل شركة تسويق الكترونى اتصلو بنا . وهي خدمة تحدث من بين خدمة نقل الأثاث، حيث يتم اعادة تركيب العفش في أعقاب نقله وتوصيله، ويحدث وضع بتنظيم وفي نسق، فيعود لسابق عهده قبل النقل، ويراعى تطهير وازالة جميع مواد التغليف التي كانت تغلف العفش لأجل أن لا يزدحم بها البيت، أو يتطلب لإرجاع تطهير، فيكون المقر مستعد للعيش فيه بلا بذل أي تعب إضافي من ناحية الزبون. تعمل شركتنا مؤسسة مكافحة العقارب بنجران على البحث العلمي في مختلف المعالم المخصصة بمكافحة العقارب والتخلص الختامي منها، لأنها من الحشرات الخطيرة والسامة والتي من المحتمل أن يقوم الإنسان بدفع ثمن عدم المراعاة لوجودها حياته أو حياة واحد من أشخاص عائلته. - امتحان الموضع الملائم, أي تكون في مقر يحاول أن جلب الحشرات من داخل المنشأة وليس من خارجها. - يلزم أن يفحص مصباح الأشعة فوق البنفسجية دورياً لأنه يفقد فعاليته مع الدهر. - أن يتم تطهير قاعدة الصاعق بلا انقطاع لأجل أن لا تكون ملاذ للحشرات الأخرى الزاحفة مثل الخنافس.